Cette maison en bord de mer rénovée à couper le souffle offre une grande intimité au bout d’un chemin privé et s’élève au-dessus du bord de l’océan, à côté d’une belle plage de corail blanc de pierres de lave, offrant une vue panoramique sur la côte de Kona à Hawaii, Big Island. Cette belle maison en bord de mer est complètement autonome avec une grande salle pour manger et salon connecté à la grande véranda couverte en plein air, donnant sur la cour spacieuse, avec un kiosque, des étangs, des cascades, une piscine et un spa, des dauphins et des baleines. Situé à seulement 1,5 km de la ville de Kona, où de petites plages de sable, des chartes de pêche en haute mer, des excursions de plongée sous-marine et avec tuba, des boutiques et des restaurants décontractés sont disponibles. Ou de poursuivre plus des meilleures expériences de vacances de l'île d'Hawaï avec un lecteur autour du île. Randonnée sentiers de volcan, monter à cheval avec Cowboys hawaïennes, et Star-regarder au sommet du Mauna Kea! Il y a deux plages célèbres à proximité: Magic Sands Beach à environ 1,5 km au sud et Kahaluu Beach à environ 1,5 km au sud de Kohola Kai. We rented this spectacular home for a multi-family, multi-generation weeklong vacation. The layout was perfect for our group (one family of mom/dad plus three kids - 14, 13 and 9, and one family of grandma/grandpa, mom/dad and 1 year-old baby). Everyone had plenty of space to spread out, but there was lots of great communal space too. The kitchen is amazingly well-stocked and a cook’s-delight. The home itself is artfully built and furnished. 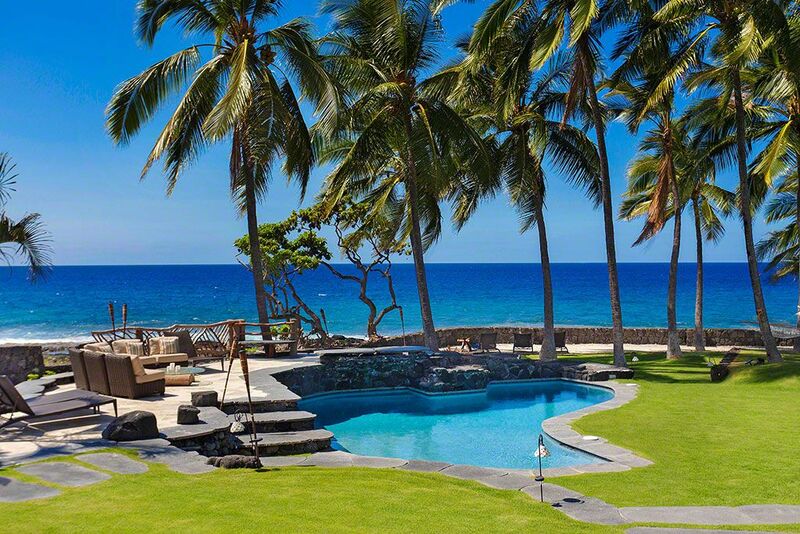 Although this home is not on a sandy beach (as with most of Kona, the coastline immediately outside the home is lava rock), it is immediately ocean-side for prize wave-viewing and you can easily walk down to the lava rocks and look at tide pools and see lots of ocean life. The pool and hot tub are glorious. We cannot wait to return!! Beautiful, well maintained home with lots of amenities! Places for the family to spread out and relax! Lots of geckos in the house and we were surprised to find a scorpion one night! The house exceeded our expectations! Great holidays with the whole family! Thank you for your recent visit to Kohola Kai! We appreciate your kind review and please let us know when you would like to return! Id give it 6 STARS ⭐️ ! Breathtaking! Wonderful Holiday Vacation with the family! This house is pristine and has a charm not conveyed in pictures. The grounds make the property absolutely top-notch with the pool/hot tub and koi pond centerpieces along with a quiet rarely found along Alii Drive. The pounding of the surf combined with the waterfalls of the pool and koi pond are wonderfully relaxing sounds compared to the traffic noise found at many homes this close to downtown. Bliss cannot be captured in pictures! Everything worked in the house and the kitchen is well equipped for most any family gathering. The gas grill got plenty of use as did the wonderful outdoor dining table. Lastly, the outdoor shower was a big hit! Surrounded by the beauty of the Big Island, one is tempted to remain "home" and enjoy the simple, peaceful beauty of this property. We have rented some wonderful homes across the globe and around the islands over the years ... this one is, without hesitation, one of the very best!